From the Dottie Rambo Elvis Presley Collection, Elvis's personally worn, signed and inscribed Tiger patch that he gave to his good friend, singer-songwriter Dottie Rambo. Elvis has written "Best Wishes to Dottie, Love Elvis" in blue ballpoint pen on the left side of the tiger, in the space between the Tiger's body and tail. The patch has additional signatures from friends. Dottie and Elvis were very good friends, and Elvis recorded some of her songs. 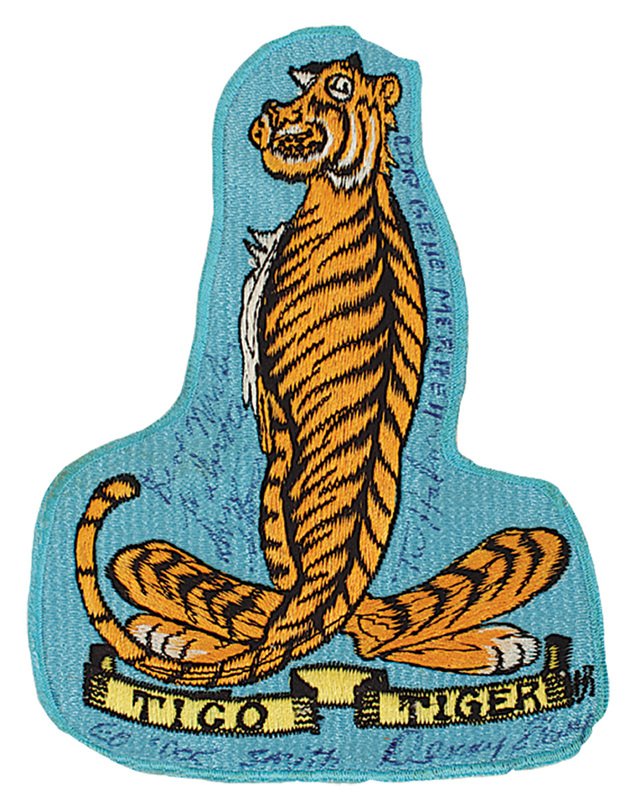 One day he noticed Dottie eyeing the patch he was wearing and later that evening he had it removed and then wrote a personal note to her about their friendship, as well as what the tiger meant to him. This was a highly cherished gift to Dottie and it was kept in a safe location until being transported to this current auction. Measures approximately 6.5 x 4.75. Very good condition. Comes with a letter of provenance from Dottie's family and a Gotta Have Rock & Roll™ Certificate of Authenticity.